Four out of six dead Ikea E12 fluorescent bulbs. Yeah, but: Don't waste your money. 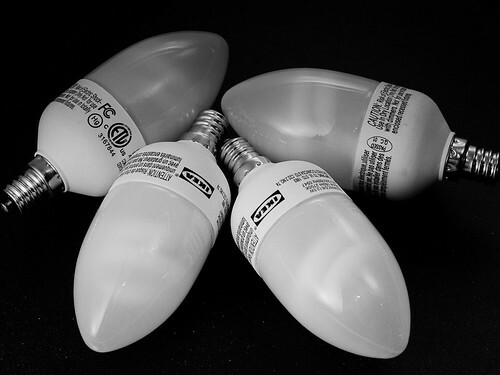 The Long Version: I purchase six Ikea E12 fluorescent bulbs from the the Orlando Ikea store in March of this year. According to the advertisement as well as the fine print on the side of the box they came in, they were supposed to have a nominal lifetime of 10,000 hours. How long is 10,000 hours? If you were to power them for six hours/day, seven days/week, then you would get 1,667 days of illumination. That's a bit more than 4 1/2 years. I would have loved to have gotten even half of that lifespan. Instead, four of the six I purchased, or 2/3rds, are now dead and sitting in the recycling bin for pickup later this week. This is not the first problem I've had with Ikea electrical and electronic equipment. Earlier in February I tried to return a pair of larger fluorescent bulbs that didn't last 30 days. We were told in no uncertain terms at the Ikea return desk that they would neither give us back our money nor exchange them for a new working pair (the later is what we wanted anyway). In addition I've got an Ikea floor lamp that won't turn on any more. What really stick in my craw are all the Ikea branded AA and AAA rechargeable battery kits I purchased last Christmas for all my electronic devices and that have also gone into the recycling bin. All, and I repeat all, would work for a time, then one day start to overheat during a recharge and then stop carrying a charge at all. I've never had a series of problems like this with other brands of bulbs, batteries, and small electrical devices from other stores like I've had with Ikea products. I pay a premium for these devices in part because they're supposed to have a long operating life measured in years, not weeks or months at the most. I don't know if Ikea hit a bad batch, changed suppliers, or what. But these were all purchased over a period of time from November 2010 to March 2011, which tells me the problem is systemic, at least at the Orlando store. The combination of poor quality and poor customer service is a loyalty killer. I've purchased my last items at Ikea. For those of you who haven't, caveat emptor. The good news is that Ikea isn't really about manufacturing quality: it's only interested in doing good works and raising money for charity. Well, it's actually only interested in the money part, but who's going to mind?